I have always wanted to visit Niagara Falls. As a kid, I can remember watching footage of Karel Soucek going over the falls in a barrel. The illegal stunt was what first caught my attention, but it was also the first time I had seen footage of the magnificent falls and I was hooked. Then and there, I swore I would visit the falls one day. Thirty years later, I did and because it was a special trip, I decided to push the boat out and stay in a top class hotel in Niagara Falls. The Marriott fitted the bill perfectly. It is on the Canadian side, so that’s another country ticked off my must visit list. 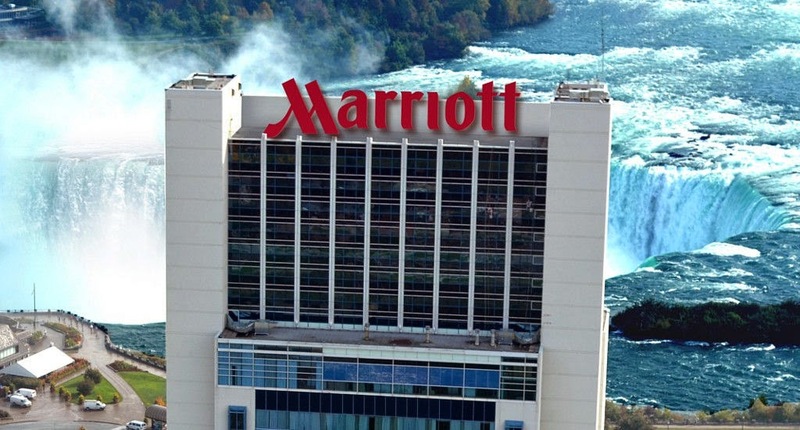 Best of all it is the closest hotel to the falls. Most of the rooms have spectacular views of the falls, so I booked one of them and was not disappointed. It was breath taking, but if you want the best views, you should really stay on the top floors. I thoroughly enjoyed eating breakfast looking out on the falls. You eat breakfast on the fourth floor, so the view of the falls is great especially on a sunny day. Speaking of food the room service is great, but the best thing about the hotel, food wise, is the Terrapin Grille. The food served suited my tastes and the portion sizes were generous, so it gets my vote. The quality of the rooms is high. My room was well proportioned and I had a spacious bathroom with a lovely deep tub. My shower was not bad either with good water pressure. Apparently, there are some stunning rooms on the top floors that include a two person Jacuzzi. I am not much of a spa person, but decided to take advantage of the hotel’s facilities and try everything. The spa facilities were exceptional. There is a steam room, two whirlpools and a sauna. I spent quite a bit of time in the hotel’s indoor pool and really enjoyed myself. The sundeck was my favourite spot. I also put my head around the door of the fitness room, but did not use the equipment. My impression is that there was everything you need in the gym, but not having used the equipment I can’t really comment on how good it is. As well as enjoying the sundeck, I treated myself to several spa treatments by buying a spa package, which saved me about 12% on the normal cost. The spa is beautifully decorated and the staff looked after me well and I enjoyed all of the treatments. The hotel offers some nice extras like valet parking. I found the staff attentive and very accommodating. The atmosphere in the hotel is tranquil. This is helped by the fact it is located a little outside of the main tourist area, but it is close enough to everything to make the hotel a great base for visiting the falls and the surrounding area. I would highly recommend this hotel as a base for anyone. If you are looking for a romantic break, the hotel has all of the necessary elements especially if you book one of the suites on the upper floors. Maple Ridge mompreneur makes it to Dragon's Den!